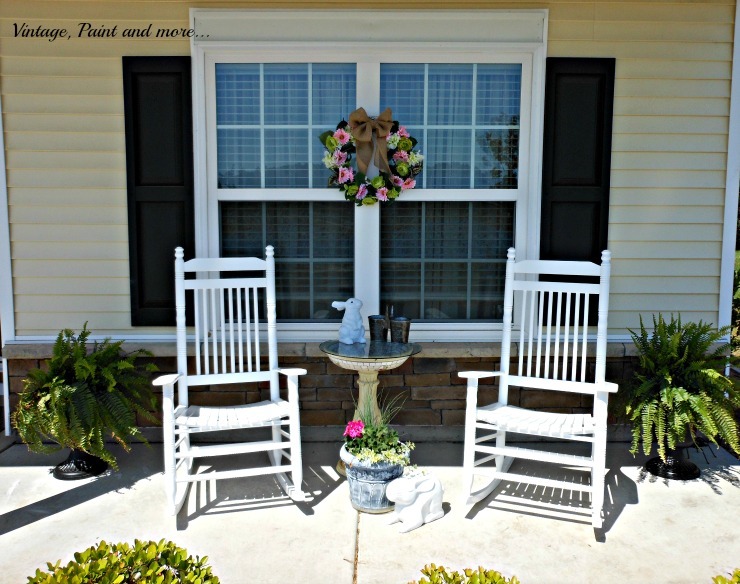 I finally finished the last Spring project for the front porch so I thought you might like to see what I have done out there. 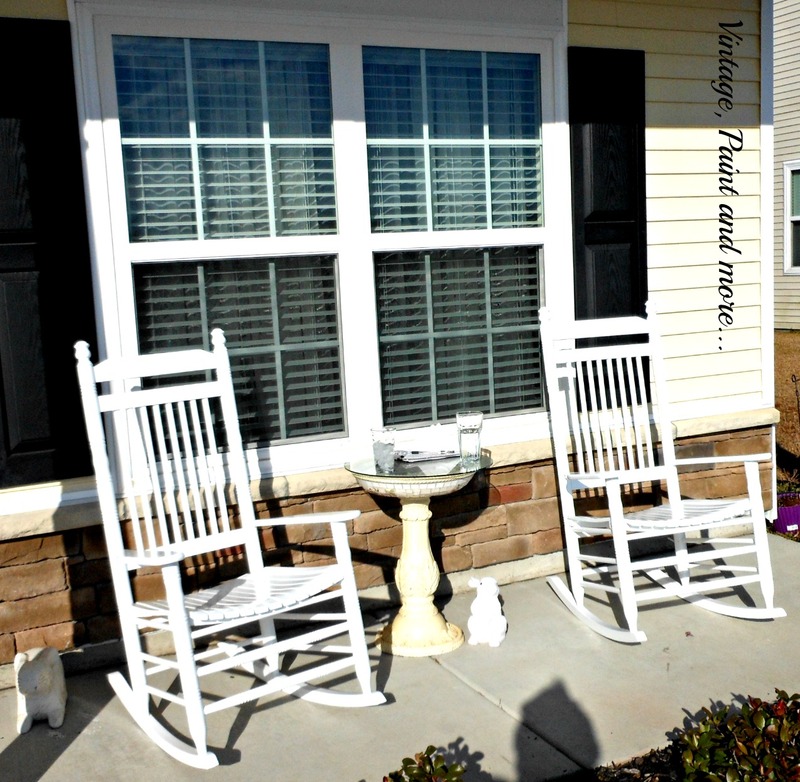 You may remember when I posted about picking up two white rockers for our front porch and how it looked then. Just a plain porch with lots of potential. I moved the Spring Wreath I just made to the windows to showcase it as our front door is actually recessed and hard to see. I love how it brings in more color and puts a finishing touch on this seating area. The little birdbath that sits between the chairs was a gift from our oldest grandson many years ago. I love the beauty of this piece with all its mosaic work. I used it as an end table in our living room for several years before it was relegated to the porch. I decided to add a small terracotta bunny I gave a coat of grey paint to and a little double galvanized bucket to the top. 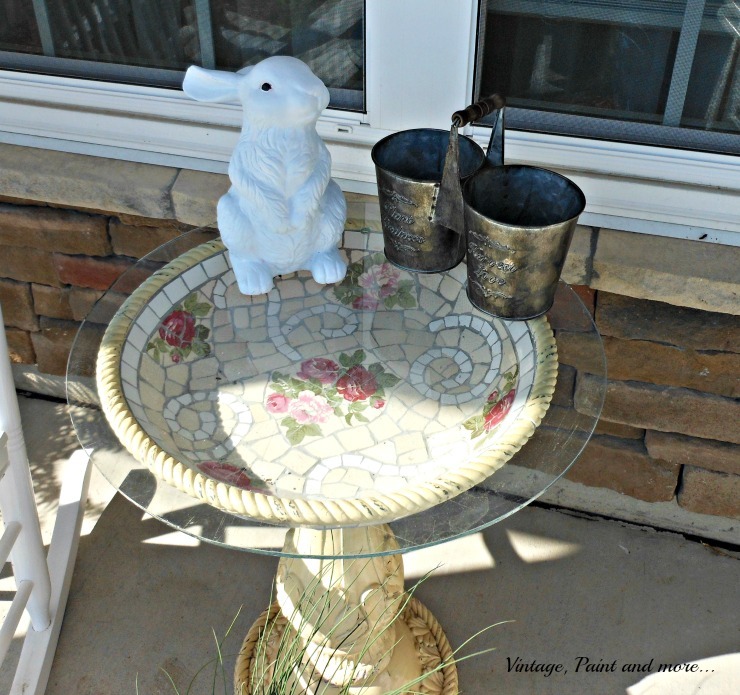 In front of the bird bath is the sun loving container pot I put together last week and my carved wood rabbit. The rabbit just received a new coat of paint also. 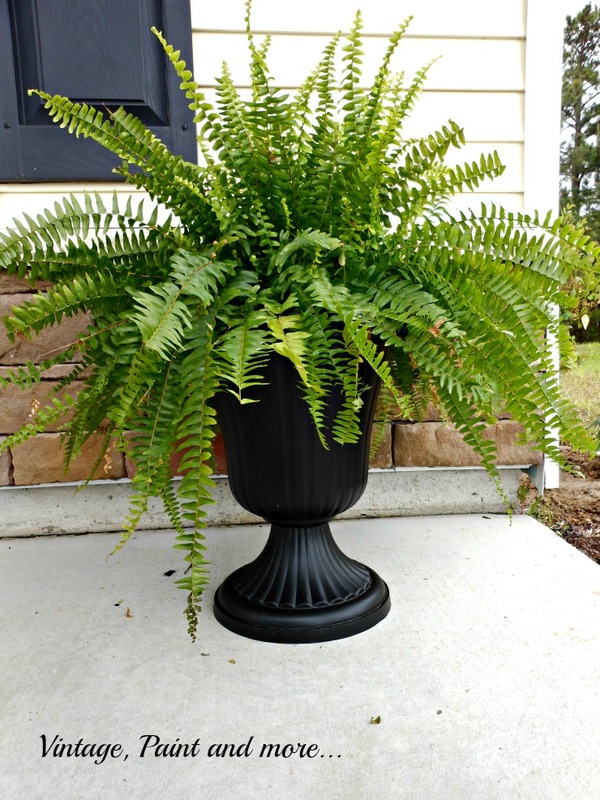 I placed a black urn that I upcycled on each side of the porch and then placed a Boston fern in each one. I have always loved how beautiful these plants are and how pretty they look on summer porches. 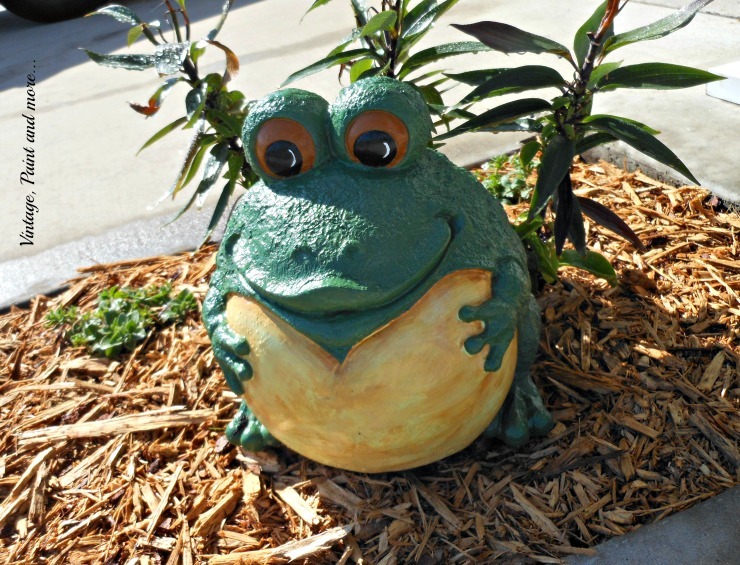 This little guy greets all guests as they come up the sidewalk. He was one of those plain garden statues that I decided to paint up a bit. I think he is so cute smiling at everyone as they approach. 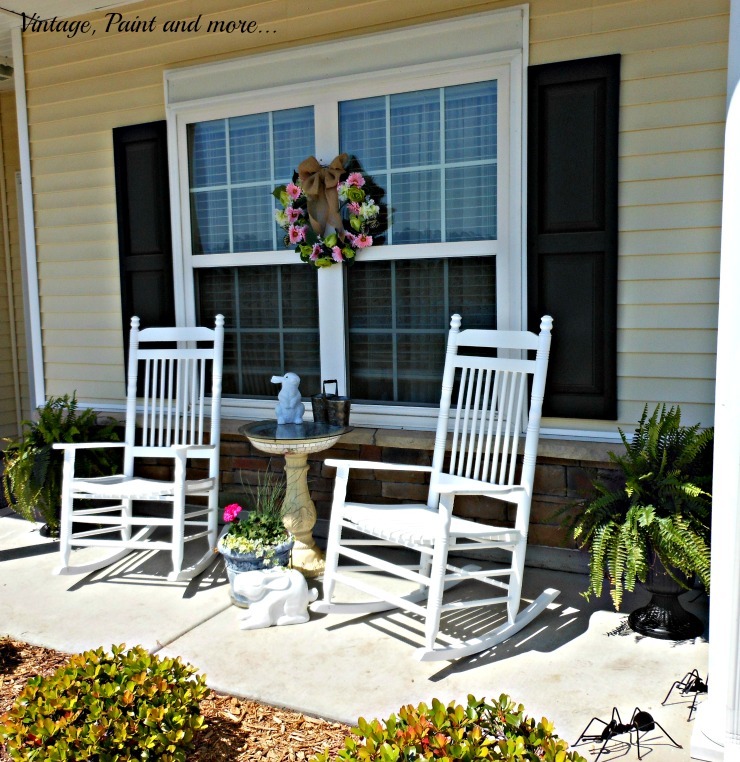 Just a few simple little projects brought this bland front porch to life. We love spending our Spring mornings out here drinking coffee and watching all the construction and hubbub in the neighborhood. Then in the afternoons we have all the neighborhood walkers and kids riding bikes. In the evenings we are entertained by the geese and ducks returning to the lake across the street. Always something to watch and now a beautiful place to sit and enjoy it. Grab your drink of choice and come join us one day. I promise you'll be entertained. How are your Spring projects going? We still have a lot of landscaping and transplanting to do in the back yard and tweaking on the screen porch but each day we get closer to done. 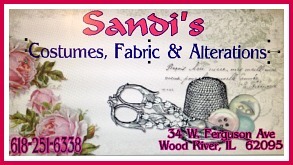 Hopefully the nice Spring temps and weather continue and summer doesn't start too soon. Want to make sure you don't miss anything - then be sure to sign up for my emails in the Hello bar at the top of the page. I will be linking up to the parties that are listed on the Where I Party page. 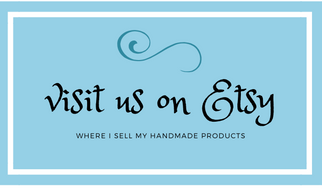 Be sure and stop by and check out all the wonderful inspiration and creativeness found at each one. How beautiful, I especially love your frog (or is he a toad?)! I would love to sit there in the sun, so relaxing. Makes me think about what I could do to my little balcony... it's more of a walkway to my my door, but I'm sure I could make more of it than I do... now you've got me thinking! I love your front porch. It looks so inviting. Thank you so much for coming and sharing it with us at our What to do Weekends party! This is so beautiful! I could only imagine sitting on this porch with a cup of something for real and being entertained all day by passer-bys! No spring decor here yet - crazy weather! Thanks for sharing with us at Home Matters link party! We hope you join us again! You've done a lovely job of combining lots of different elements to make it all go together so well. It looks like a great spot to spend some time! I love your porch! The rockers are so nice! Please link up to Idea Box on Thursdays! Your porch is just gorgeous! Your porch looks so nice! 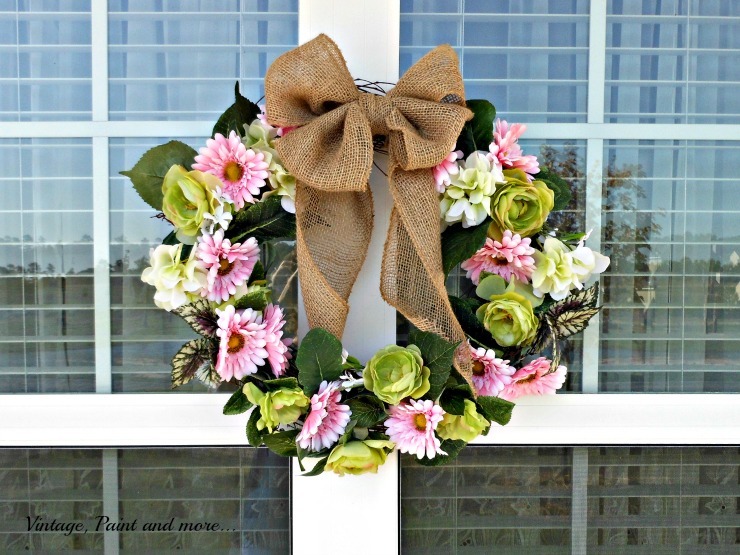 I love the wreath you have hanging on the window! Cathy, white rockers on a beautiful porch, what could be better than that? I would want to hang out here for hours! Thanks for sharing with SYC. What a beautiful porch! I wish I had a bigger front porch so I could decorate it! Thanks for sharing at Motivational Monday! What a wonderful spot to relax and enjoy! 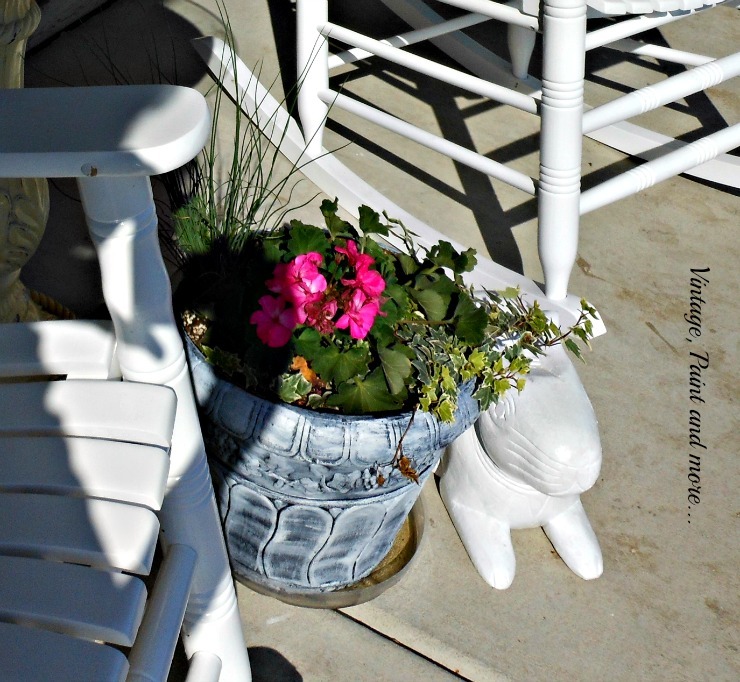 I just love rockers on porches!